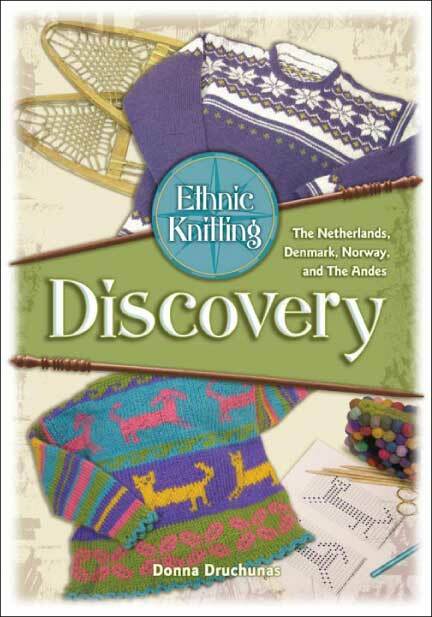 Welcome to the ninth stop on the blog tour for Ethnic Knitting Discovery, by Donna Druchunas. I'm the book's publisher, under the name of Nomad Press. Because Nomad Press is a micropress, I also do a lot of jobs other than "publish." That's a chunk of what I talk about on this blog during regular posts. When Donna asked what I'd like to do on this blog tour, I said something like "talk about the development of the illustrations for Ethnic Knitting Discovery." As I began to put together a few notes for how I'd go about this, I realized that the reason it took so long to develop the illustrations is that there were a bunch of different types of images and they all required different processes to be converted from ideas to what readers see on the book's pages. So I'm going to start here by talking about (1) the front cover. With luck and fortitude, in future days I'll also manage to assemble posts about (2) the charts and swatches, (3) the schematics and flat drawings, (4) the techniques, and (5) what we've been calling the "model shots," or project drawings. I've already started assembling the visuals for those additional posts, but let's get to the cover. Cover development begins about a year before a book's intended publication date. Right now, we're working on the front cover for the next book in Donna's Ethnic Knitting series, which we plan to release in October 2008. We begin by gathering visual resources for the cover designer to work with. Although I design Nomad publications' interiors and other materials myself, I hire other folks to do the covers. I love the synergy of this process. But it's still the author's and my responsibility to get the designers as much good stuff to work with as we can generate. 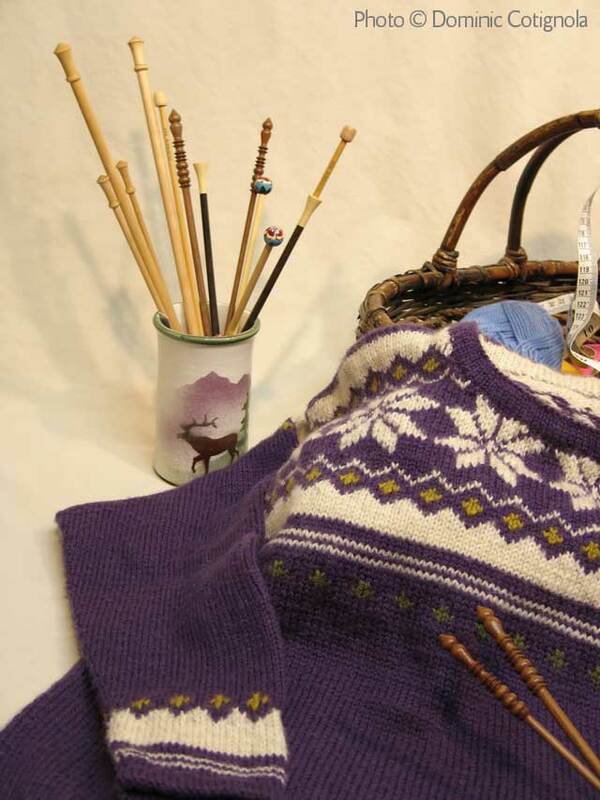 Donna worked with knitter Debbie O'Neill on ideas for the sample sweaters that would be knitted to show on the cover. 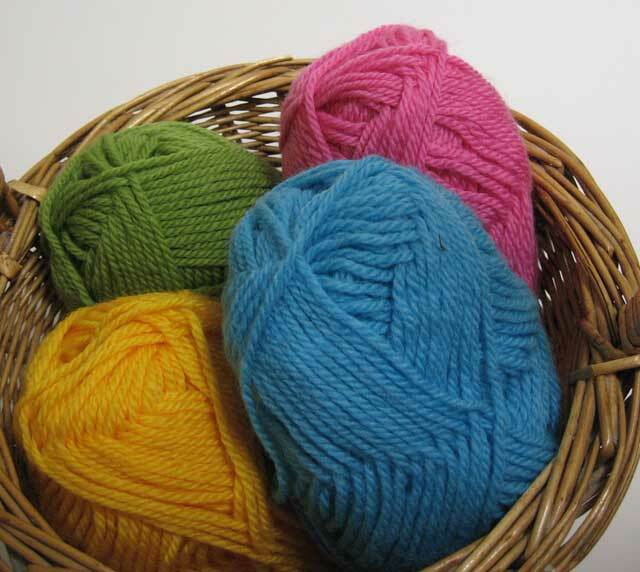 We all consulted on colors; the goal was to have fun and work within the spirit of the knitting traditions presented in the book, not (for this series) to duplicate historic garments. We offered Debbie a lot of latitude to work within the philosophy of the book and design the garments using its system. 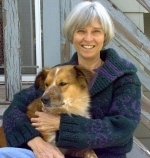 The book contains brief descriptions by Debbie of how she approached her designs. This was also an opportunity for Donna to see how the book's unusual approach would work in the hands of another knitter. The results thrilled all of us. We had dozens of alternatives for each garment, shot at different angles, with a variety of props, and in a lot of different ways. We also put together supplementary images—of a globe, of yarns by themselves, of yarns and knitting needles, of many types of knitting needles all by themselves, and other things. And play she did. After a while—not very long, actually—she sent us a set of ideas and asked for our reactions. It's good to have between three and five concepts initially; some will be radically different from each other, while others will be variations on a theme. Monica gave us four designs, two variations each on two ideas. We printed them out full size and taped them to the cupboard doors in the kitchen and looked at them while we went about our daily life for a few days. The problem we had with this selection was that everything we saw could have worked! You can see different type treatments, color variations, photographs, emphases, and placement of elements. Sometimes there will be a part of a cover that we'll just love but we'll have to let it go because it doesn't work with the cover that ends up as the final design. That's how I feel about the edges of the title type block on the third cover from the left—in fact, about the entire sort of floating layered effect of the elements of that design. We knew when we started this project that there would be three books in the series, so Monica began with the ideas that there should be a recognizable logo component to the cover and that the general format of the initial title would be adapted for the subsequent books. The compass rose with the words "Ethnic Knitting" on the two lefthand covers drew us all. When we took the cover printouts to our local bookstores to see how they looked next to a bunch of other books in the knitting section, we discovered that the layout of the two righthand covers is somewhat reminiscent of a series from another publisher (Monica didn't know this; she came up with a good solution that echoed someone else's good solution that was already in print). The largest type in the three lefthand covers is a face that I'd been using for display type as I worked on the interior (Abbey Road, by Nick Curtis of Nick's Fonts). While I told Monica about the fonts I was using inside, she wasn't restricted to them. If she'd come up with the perfect design anchored with a different typeface, I would have modified the interior to include it, so the inside and outside of the book would be in harmony by the time we were both done. 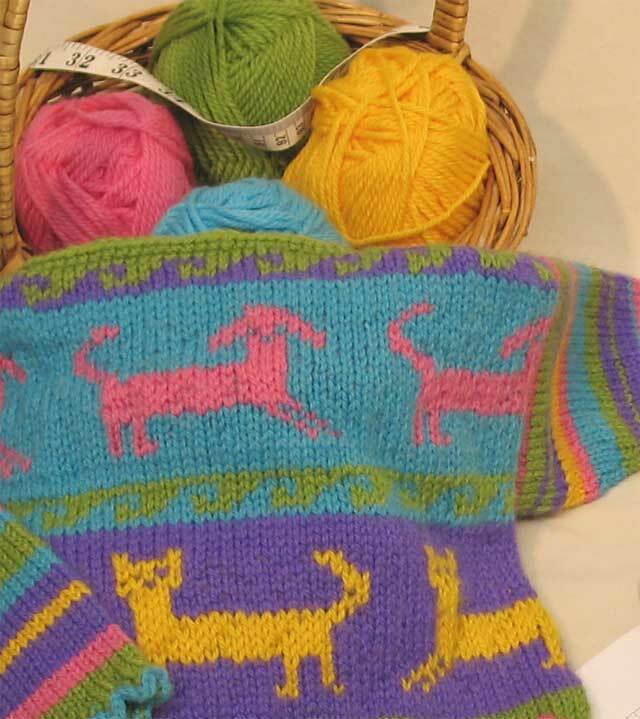 We thought the pink in the far left version took attention away from the sweaters (plus we didn't want to "girlify" the content with pink) and that the green complemented them. The preliminary version was pretty darn close to the final. You can also see in the larger image of the final cover some of the massaging Monica did with the sweater images. She customized the backgrounds of the sweater photos to integrate them with the overall cover design and give them a sense of dimensionality. Between initial idea and real version, we extended the height of the book by an inch, which gave us more room to work with on the cover. The subtitle ("The Netherlands, Denmark, Norway, and The Andes") is bigger and easier to read, as is the "Ethnic Knitting" compass rose. Monica was able to adjust the positioning of both sweater images so the garments were cropped more intentionally. The whole lower sweater shows in the finished version, and it's easier to see the shape of the little Andean bag and to tell what the crochet hook is. The upper sweater has more room to breathe and you can see a bit of the patterning on its lower edge. The cover design set the direction for other aspects of the book's production--for example, the green used as a second color in printing the interior keys off the green in the cover's title block. When the front cover is done, it's put to immediate use and starts appearing on the web. Two other critically important parts of the cover—the spine and the back cover—are designed very late in the process, perhaps a month before the book goes to press, or about ten months after the front cover process begins and about eight months after it's completed. But that's a story for another time, and likely will be told with regard to another book. I'm such a sucker for behind the scenes information. Thank you so much for this. Really an enjoyable read. I read the credits in movies and on CD jackets, so this is right up my alley. I never would have thought to take the cover to the bookstore and look at alongside other covers -- a brilliant tidbit. I'm looking forward to more of these posts. I love working with Nomad Press because I get to have input on the cover. With most publishers, they send you a cover and all you're allowed to say is, "OOH, Aahhh, how beautiful!" The snowshoes make the BAM for me! That's really interesting to read how a cover is put together, looking forward to the rest!